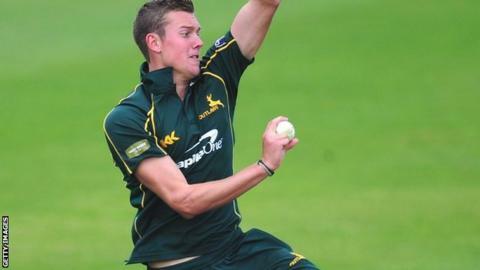 Nottinghamshire's young player of the season Jake Ball has signed a one-year contract extension. Director of cricket Mick Newell said he has been impressed by the 21-year-old seam bowler, who took five wickets in the CB40 competition last season. "Jake has improved immeasurably over the last two seasons and we feel there is still more to come," Newell said. "He's at the age where performance counts and his returns in limited-overs cricket will be very important." Ball added: "I felt more comfortable in the CB40 last season and I want to ensure that I do myself justice next season. "I'm generating more pace and I feel that I have enough control to impress during pre-season and force my way into Mick's selection."